Carpal tunnel syndrome (CTS) is a condition involving a compression of the median nerve within the carpal tunnel of the wrist, due to a raised pressure within this compartment. Compression of the median nerve leads to symptoms of pain, numbness, and paresthesia in the lateral 3½ digits. CTS accounts for 90% of all nerve compression syndromes. It is more common in women and has peak incidence between ages 45-60 (only 10% of CTS cases are in patients under 30 years of age). In this article, we shall look at the risk factors, clinical features and management of carpal tunnel syndrome. The main risk factors for developing carpal tunnel syndrome include female gender, increasing age, pregnancy, obesity, and previous injury to the wrist. Individuals who have occupations involving repetitive hand or wrist movements (e.g. vibrating tools or assembly line work) are also at increased risk of CTS. Patients with carpal tunnel syndrome typically complain of pain, numbness, and/or paraesthesia throughout the median nerve sensory distribution. 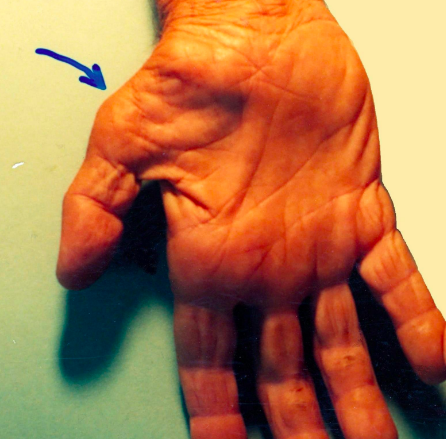 The palm is often spared, due to the palmar cutaneous branch of the median nerve branching proximal to the flexor retinaculum and passing over the carpal tunnel. Symptoms are typically worse during night and symptoms can often be temporarily relieved by hanging the affected arm over the side of the bed or by shaking it back and forth. On examination there are often no visible findings during early stages of CTS. However, sensory symptoms can be reproduced by either percussing over the median nerve (Tinel’s Test) or holding the wrist in full flexion for one minute (Phalen’s Test). In the later stages of carptal tunnel syndrome, there may be weakness of thumb abduction (due to denervation atrophy of the thenar muscles) and / or wasting of the thenar eminence (Fig. 2). Figure 3 – Schematic of the cutaneous innervation of the branches of the median nerve. Carpal tunnel syndrome can be treated conservatively initially with a wrist splint (commonly worn at night), preventing wrist flexion and holds the wrist as to not exacerbate the tingling and pain, alongside physiotherapy and various training exercises. Corticosteroids injections can be trialled. They are administered directly into carpal tunnel to reduce swelling and in turn symptoms. Some clinicians may also trials NSAIDs in an attempt to further reduce swelling, however there is limited evidence to support their routine use. Surgical treatment is undertaken only in severely limiting cases where previous treatments have failed. 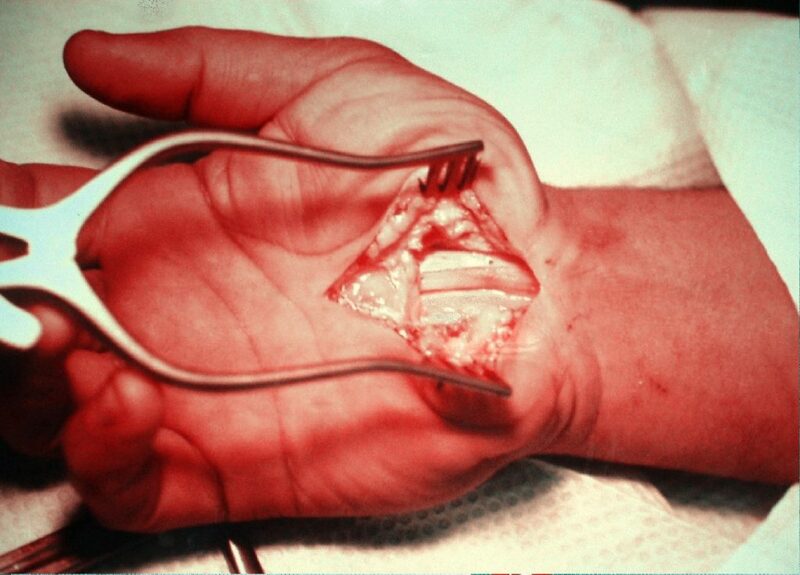 Carpal tunnel release surgery (Fig. 4) decompresses the carpal tunnel, involving cutting through the flexor retinaculum, in turn reducing the pressure on the median nerve. This can be done under local anaesthetic and is performed as a day case. Complications of carpal tunnel surgery include persistent CTS symptoms (from incomplete release of ligament), infection, scar formation, nerve damage, or trigger thumb. However overall outcomes from surgery are good, with 90% of patients reporting improved symptoms afterwards. Long-term untreated CTS can lead to permanent neurological impairment that will not improve with surgery.